As part of IT.com , ILUG wanted to show some Indianized Linux apps if possible. As we know most of the Linux apps are already internationalized. What is required is localization. Even thou localizing to indian languages has some problems, there are hacks which allow us to achieve it still to some extent. Want to help, then check this out. gtkicq : Internationalized and Indianized. Uses tagged message passing, so that the recieving person can read the message in the language in which it was entered, provided he has the required font. gkeymaps : A Gui frontend to the xmodmap keymap files, with a sample kannada keymap file. gfontkb : Internationalized and Indianized. Provides a simple and dumb OnScreen keyboard. tried developing a bdf font with 7-bit ascii and malayalam chars in them. However, when I set it as the font in gnome-terminal, The width of the terminal suddenly grows like hell. In Xterm, it crashed, the server. Where as in other graphical apps, the font works properly. Can anyone help me in solving this problem. I am new to fonts and don't know its a,b,c also properly. Uploaded the newer gfontkb (v0.44.2) , which fixes a bug in the earlier version, which I had released. I have written a opensource program called gFontKB ( a simple, dumb OnScreen keyboard ) It shows all the chars or glyphs in a font as a onscreen keyboard. One can select the font to use and Type in characters in this font. Using this onscreen keyboard by clicking on the buttons. Useful for NonTranslative or NonPhonetic fonts. Also one can directly enter or edit the contents of the textbox. Useful for Translative or Phonetic fonts. All that one enters is placed into the textbox provided. And one can cut and paste it into any application. Either way, Using gfontkb and selecting the respective font, will give you a idea of how the characters are distributed, and will also allow you to enter the translated text directly using the OnScreen keyboard. These files contain the string to be translated - identified by msgid "blah blah"
and the space for the translated string - identified by msgstr ""
Translate the string identified by msgid and place it infront of msgstr. Step to do the translation. Download and Install the TrueType font for your language, The font used should be the one specified in this website. In gfontkb or GEdit or Notepad or any editor which supports selection of fonts, Have this font selected. Type in the translated string in your language into either gfontkb or GEdit or Notepad ..., depending on which ever you use. NOTE: You should be seeing what ever you enter in your language, else, something is wrong. Please verify the above steps once again. Have the POT file whose Message Strings you are translating opened in a text editor like vi or emacs. (if using emacs, be careful about the po mode, understand it properly if u use it). Cut and paste the translated string from gfontkb or GEdit or ... into the POT file opened in vi or emacs or any plain text editor of your choice. The translated string which you pasted into the POT file in vi(or emacs or plain text editor of your choice) will appear in english (or which ever language you use by default) with maybe few strange characters in it. This is fine, because your editor is showing the string in translated language as if its in english. The RFC for Linux For India is up now. 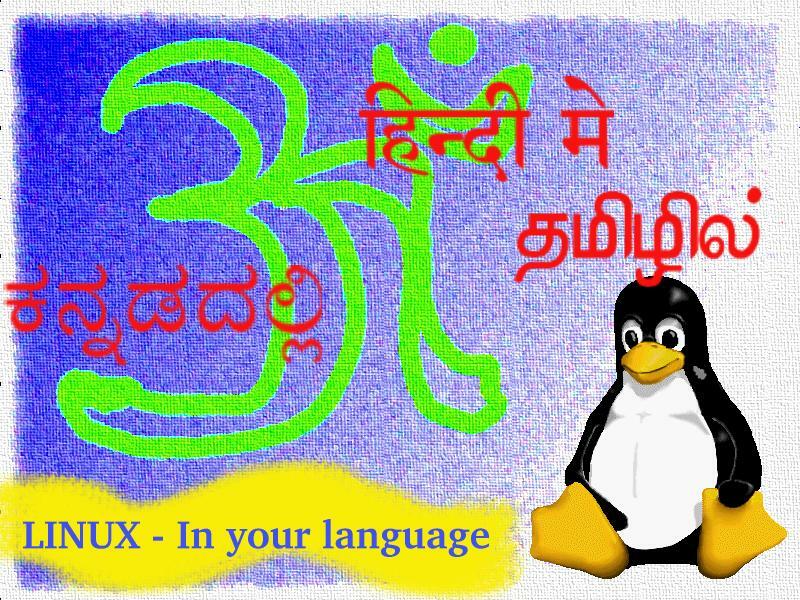 Checkout the Poster for Linux For India. Today I patched the gtkicq v0.62 source code, thus adding multilingual support to it. I also added the Hindi translations to it. So here is my attempt at achieving it: I will be updating this page in a few days, however in the mean time, here is the result of the 1st steps into it. Franklin, Ajay, Shaji, Parimala, Mathew, Madhu for helping me in translating the english text to hindi equivalent.